Finding the best baby food for your little one when they’re ready to transition from baby cereal can be confusing due to all the options. Organic baby food is a great option if you can afford it, but for those who don’t find organic necessary or want a more affordable option, natural baby food is another great way to go. Here’s a list of the top baby foods you can find, organic and non-organic. Any of these baby foods are a great option for your newbie eater. Happy Baby (or else known as “Happy Family”) is starting to give other big baby food brands a run for their money. Happy Baby produces an awesome line of not only baby food but infant formula, toddler nutrition, snacks for older kids, and even prenatal nutrition. They deliver whole organic foods without artificial colors, concentrates, or flavors ensuring your kiddo will get the purely good taste of only the ingredients in the pouch. Their new line of pouches, “Clearly Crafted” feature a clear plastic window to shed light on how colorful and pure their ingredients truly are. Can we also say that actually seeing how beautiful your food makes it taste way better? 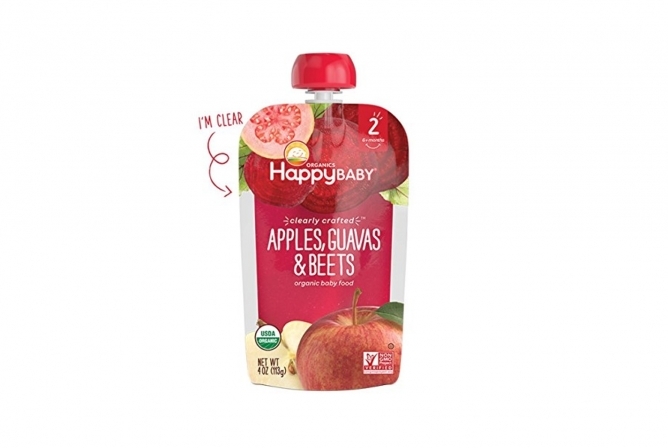 Happy Baby offers Stages 1 through 3 of baby food pouches starting off with single ingredients for newbies, creating more complex fruit and veggie flavors for Stage 2 pouches, and ending with savory and gourmet flavors for Stage 3 pouches. But what makes Happy Baby have the best? Not only do they have daring and exciting flavor combos, like “apples, guava, and beets” or “purple carrots, bananas, avocados and quinoa” that make for interesting but seriously delicious combos, they’re also certified organic, BPA-free, non-GMO, kosher, and gluten-free. Happy Baby also produces a huge line of toddler foods like their superfood toddler pouches, organic toddler milk, and organic snack foods. The list goes on! You can tell that the Happy Family brand truly cares about all-around nutrition for the entire family. The MSRP for baby pouches $0.60/oz but check the Happy Baby Organic Baby Food – Amazon price here. Earth’s Best is seriously a top contender when it comes to anything baby food, and the price is amazing (especially for their jarred baby food). They are one of the only (and first) companies to offer a complete line of organic baby food from infant-hood to childhood. from Earth’s Best Organic Baby Formula and organic baby cereal to pureed foods and finger foods like puffs, snack bars, and freeze-dried fruits and veggies. They even have little entrees for older kiddos that are great for eating meals on the go. Seriously, they have it all! Earth’s Best Baby Food comes in a few different packages and stages. You can find baby food offered by Earth’s Best in 4 oz jars ranging from Stage 1 (single fruit or veggie flavors) all the way to Stage 3 which offers gourmet baby food meals with chunky textures and fun flavors. The quality of their food is high, as all ingredients are certified organic, kosher, non-GMO, and artificial color, flavor, and preservative-free. The only preservatives you will find are citric and ascorbic acid (Vitamin C) to help preserve the freshness of some foods, and these can sometimes cause acid reflux for sensitive tummies. Another fun option (and the new baby food craze) are Earth’s Best Baby Food Pouches that also come in Stage 2 and 3. Stages 2 and 3 offer more fun and complex flavors that will tickle your baby’s taste buds and are great for traveling or on-the-go. The texture and flavors are also spot on; not too runny with purely clean flavors from purely clean ingredients. Earth’s Best is always a great choice and is easy to find online and in almost every grocery store. Earth’s Best Baby Food MSRP is $0.25/oz, but check the current Earth’s Best Baby Food – Amazon price. Beech-Nut is a popular brand that can be found in many stores and online. This company offers a huge range of baby food products, and all are high-quality and non-GMO. 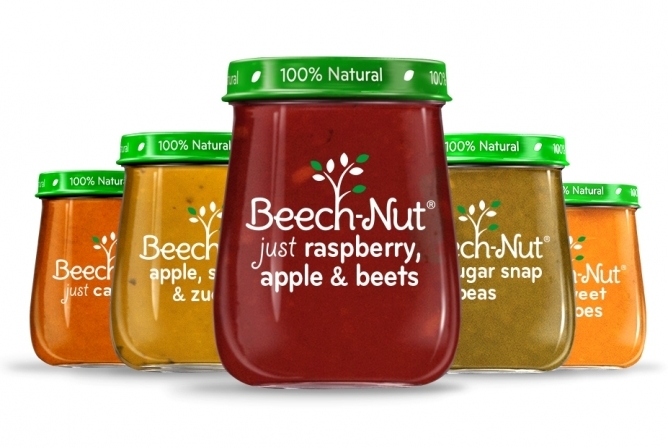 Beech-Nut is one of the only baby food companies that still put their food products in jars, a great option for parents looking for chemical-free packaging. Other than the jars, Beech-Nut offers baby food in pouches, too. They offer baby food in Stages 1 through 3, from oatmeal up to finger foods for toddlers. This well-rounded company also offers an organic line of baby food for parents interested in trying organic food. What makes Beech-Nut great for babies with sensitive tummies is their attention to pure ingredients. This is one of the only non-organic baby food companies that sources whole ingredients and doesn’t add in artificial ingredients, colors, or harmful preservatives. Whatever is on the label is in the jar (or pouch). The texture and taste are right on because Beech-Nut blends their food before cooking and removes air to seal in freshness, both methods that keep nutrients intact without needing artificial preservatives. Ultimately, the simpleness of Beech-Nut ingredients will protect your baby from harmful ingredients that can cause an upset tummy. In addition, Beech-Nut offers a cereal for sensitive tummies. MSRP for Beech-Nut is $0.30/oz but check out the Beech Nut Baby Food – Amazon price right now. Plum Organics is another popular and awesome baby food brand that carries some exciting products. They offer a few different and fun lines of baby food. Their first line is offered in all-popular Stages 1 through 3 with Stage 1 starting as the most basic flavors and Stage 3 ending in some seriously delicious and gourmet meal flavors for older babies. Another line of baby food they offer is called their “Eat Your Colors” line which features fruits and veggies that are of a particular color like beets, apples, and red peppers for red or cauliflower, leeks, and apples for white (the list goes on). This is a fun way for kiddos to learn the colors of the foods they’re eating as well as learn those different flavors. Yet another fun line of baby food pouches that Plum Organics offers is their “Grow Well” line. This line groups certain foods together that helps address main areas like “digestive support” or “brain development” and even “bone and muscle development”. They also offer nutritious and creative products for toddlers and kids like superfood pouches, snack bars, snack sticks, and true fruit snacks. 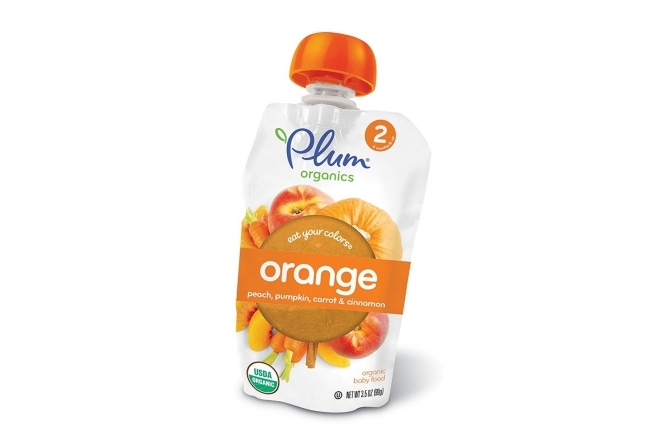 With an MSRP of $0.50/oz, check the Plum Organics Baby Food – Amazon price here. Gerber is a household name, and for good reason. Gerber has been producing quality baby food since 1948, and they don’t plan on stopping anytime soon. 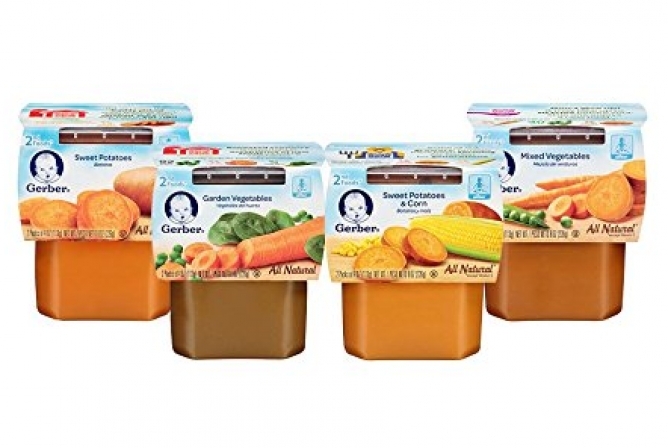 Gerber Baby Food is served in either a BPA-free plastic container or pouches and they have a full line of both natural baby food and organic baby foods, offered in Stages 1 through 3. Price has always been a great feature of Gerber baby foods. A few downsides to Gerber are that there is a possibility for artificial colors and ingredients. Some foods contain added ingredients to make the food’s texture and flavors taste better. Another point that some parents have made is that many Gerber foods are a little on the runny side and not a thick and natural consistency that other foods have. However, Gerber is consistent about producing great products for families at a great and affordable price. With an MSRP of $0.25/oz, check the Gerber Baby Food – Amazon price here. No matter which food you choose for your baby to try, always look for simple ingredient lists that are sourced from whole foods. If you can, making your own baby food is the best way to go to make sure your baby is getting great ingredients for the best price. Providing the purest taste of fruits and veggies will ensure your baby develops a palate for healthy foods, making it easier to feed them fruits AND veggies when the time comes for solids.